This dress is incredibly beautiful and detailed - pictures do not do it justice! There is lace, plus Swarovski pearls and crystals spread throughout! It is the ultimate Cinderella dress and is perfect for the bride wanting to make a statement. Not only do you get the Cinderella style you also get the choice of having it as a mermaid style aswell which certainly created the wow factor when I revealed it at the reception! The detailing and effect from this dress was amazing! The train is the most stunning feature on the dress and it also bustles up twice so that you can dance later on in the evening. The princess skirt is elegently long as seen in the pictures and it hooked on nicely to the dress underneath! Once taken off the mermaid dress drops effortlessly and is slightly (not much) shorter then the skirt. The different sweetheart cut also created a different feel to the dress as its not a typical cut. It zips nicely at the back (not buttoned) and the lace flows down into the skirt and mermaid dress. 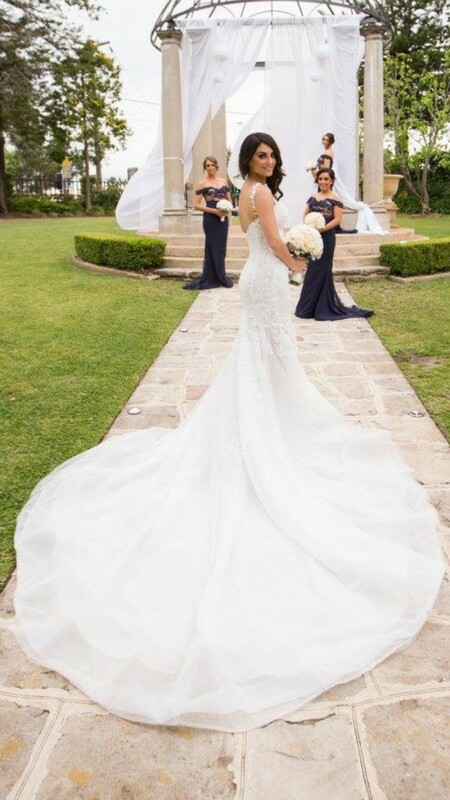 Was orginally selling for $6500 but marked down $1000 as it is not dry cleaned and has a little rip in the veil (easily fixed when you go to get it altered to your body). The veil has a hole in it, however I have deduced a lower price because of this.